CellMosaic’s size exclusion chromatography (SEC) or gel filtration protein standard is designed for day to day use to check HPLC column performance and the analysis of bioconjugates. This product is a replacement of our previously developed SEC protein standard (Part No. CM92001). Due to its instability, aprotinin (MW 6.5 KDa) is not included in the mixture. The new formulation is much more stable and can stay at RT for months without losing its performance. The kit consists of six proteins and one blue dextran with a MW range of 13.7 to 2000 KDa. The broad range of protein molecular weight coverage allows easy identification of small molecules, conjugates, and aggregates in a bioconjugation mixture, such as antibody-drug conjugation, protein, and antibody modification and conjugation. The product has been validated in many of the commonly used SEC columns. CellMosaic routinely uses this product for its internal bioconjugation-related research. A total of four micro-centrifuge tubes are in a package. Each micro-centrifuge tube contains 80 µL of frozen protein standards solution. The product is ready for use after thawing. The approximate MW of an unknown protein or protein conjugate can be determined by comparing its retention time to the protein standard. Figure 1 gives an example of the SEC profile. 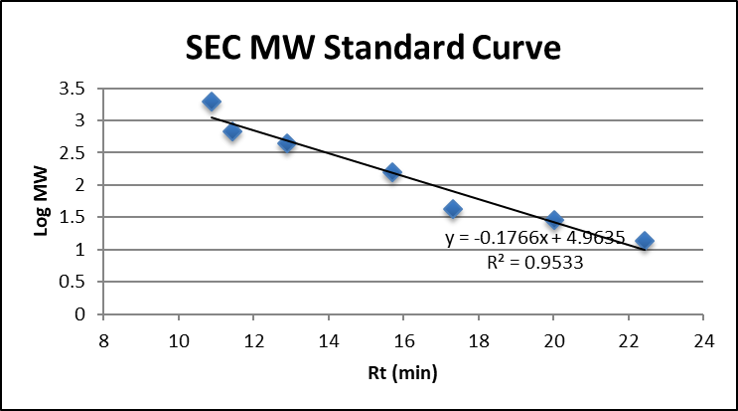 For more accurate calculation, an SEC MW standard curve is recommended (Figure 2). 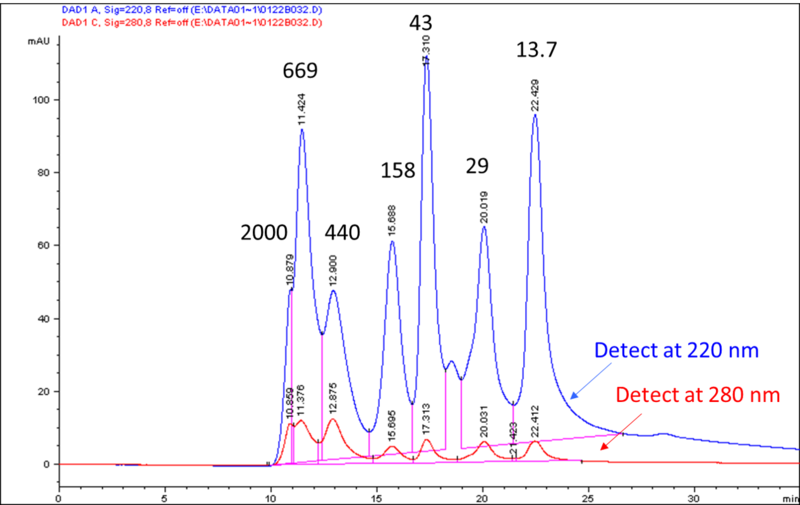 Figure 1: SEC HPLC profile of protein standards in a TSKgel BioAssist G3SWxl (7.8 mm x 300 mm, 5 µm, Part No. 0008541). HPLC condition: isocratic PBS buffer at 0.5 mL/min. Instrument: Agilent 1100 HPLC series. Figure 2: SEC MW standard curve of TSKgel BioAssist G3SWxl (7.8 mm x 300 mm, Part No. 0008541). Data from Figure 1. Click the button below to add the SEC (Gel filtration) HPLC Protein Standard (7 components) to your wish list.